I would like to share a picture of Pearl with her "baby". She took this "baby" outside and left it in the yard. Pearl came back in the house. 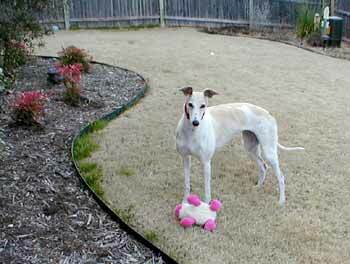 I waited until Pearl went into another room and then I snuck out back to retrieve her "baby". Well, Pearl didn't like that I moved her "baby"; she again took her "baby" and waited at the back door until I let her out and she went to the same spot and gently put her "baby" down; then she came into the house. Needless to say, Pearl's "baby" stayed outside overnight. In the morning my husband retrieved the damp, slightly soiled "baby" which Pearl immediately took up to her bed. 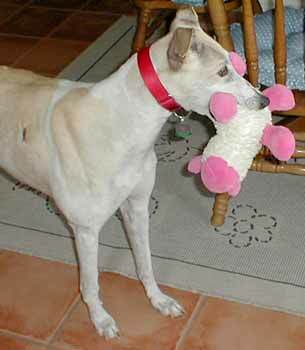 This was the first toy that we gave her - she has many, many toys which she lines up in my dining room. She is so wonderful to watch. My daughter said that she is just like a "sponge" soaking life up to its fullest.